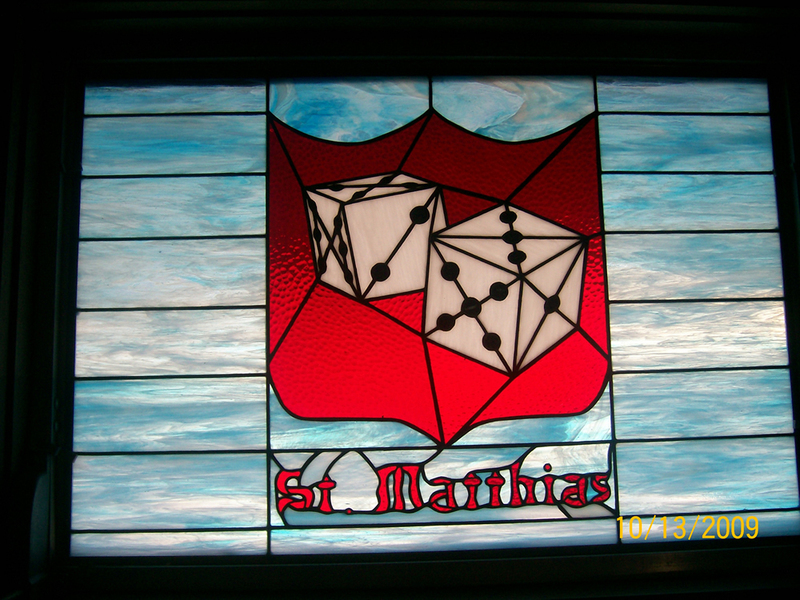 One of the symbols of St. Matthias is a pair of dice because the Disciples cast lots to decide who would take the place of Judas Iscariot (Acts 1: 15-26). The only time he is mentioned in the Bible is at the time of his selection. St. Matthias is one of the lesser-known apostles. According to the Early Church Fathers, Matthias was one of the seventy-two sent out by Jesus in Luke 10:1-20. After the ascension, Matthias was chosen by lot to fill the vacancy in the Twelve resulting from the death of Judas Iscariot (Acts 1:16-25). Early Church tradition places Matthias in a number of locations. Some historians suggest that he went to Ethiopia; others place him in Armenia, the first nation to adopt Christianity as a national religion. Martyred for his faith, Matthias may well have met his death at Colchis in Asia Minor, around AD 50. The Church of St. Matthias at Trier, Germany, claims the honor of being the final burial site for Matthias, the only one of the Twelve to be buried in Europe north of the Alps. The method is secondary to prayer. Nevertheless, the human element is removed as it is the Lord who chooses Apostles, Bishops and Pastors. He establishes the Office. Their prayer is in keeping with Jesus’ teaching that prayer should be simple for we will not be heard for our many words” (cf. St. Matthew 6: 7). They also followed Jesus as He prayed before selecting the 12 Disciples and exhorting to pray to the Lord of the harvest to send out harvesters into His field (St. Matthew 9: 37-38; St. Luke 6: 12-16) . After the selection of Matthias, lots were never used again. It is prayer that is absolutely essential. Also, preceding the selection of the unique and unrepeatable Office of Apostle, as in all offices, there were qualifications: an apostle saw the risen Jesus Christ (Acts 1: 22) and more importantly, to replace Judas, this selection was to be done as it was according to Scripture (Acts 1: 24). Scripture and prayer go hand in Hand. The Greek word “kleros”, “lots”, is the basis of our English words “cleric”/clerical”, that is, a pastor or minister and “clerk”/”clerical. A pastor is not a chance or a gamble though for many a congregation they might tell you otherwise! It can be when the pastor does not keep his office, preaching and teaching the Word of God, caring for souls and administering the Sacraments, especially when the pastor denies and ignores sound doctrine and engages in immorality. Then the pastor goes against the prayer of the Church for the Lord’s call to him. Jesus knew this: Judas. The pastor in preaching Law and Promise will not possess every talent a congregation wants and even he wants! The congregation may not like his preaching and even hate it as did the synagogue in Nazareth wanted to kill Jesus (Luke 4)! Yet, the pastor is called. Since the selection of Matthias, “kleros” came not to mean a chance, but a calling, a vocation: the cleric. Now the related word, “clerk” is considered by some to be a menial vocation, as in “menial clerk” or “minor clerk, as a clerk in a store. It did mean at one time an educated person who could read and write to clerk in a store in a time of greater illiteracy. Pastors and clerks had education in common. Yet, it is also are reminder that pastors are not to lord it over their flocks but like a clerk are called to serve. Pastors are called not to serve customers, but the flock the Word of God and the Sacraments from God (cf. St. John 21: 15-17). Clerk can also be a vocation as both clerks and clerics serve the neighbor each in their own calling. And like St. Matthias, a cleric may not have fame, as a clerk but like the Apostle Matthias, he will have served the Name of the Lord. For one in place of Judas the faithful now rejoice. And by your parting promise be with us to the end. The Greek word “kleros”, “lots”, is the basis of our English words “cleric”/clerical”, that is, a pastor or minister and “clerk”/”clerical. A pastor is not a chance or a gamble though for many a congregation they might tell you otherwise!